Dr. Lee Kaswiner, Dr. Brett Handsman and Dr. Dana Silagi are dedicated to providing the best orthodontic experience for adults, adolescents, and younger children. Our goal is to make your orthodontic experience a positive one in our personalized, relaxed, and professional atmosphere. 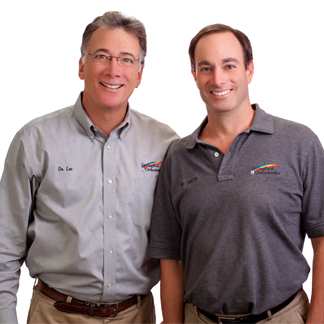 Dr. Lee Kaswiner is known in the office affectionately as "Dr. Lee" and Dr. Brett Handsman is referred to as "Dr. Brett." All our doctors are "hands-on" orthodontists providing the orthodontic treatment themselves with their registered and certified orthodontic assistants helping them to provide efficient and courteous care. When teeth are properly aligned, they look and function better, increasing self-esteem and confidence. Our orthodontic team works together to achieve the best possible smile and facial appearance for you and your loved ones! We run on time for appointments — we know how busy you are! Saturday and evening appointments are available. The iTero® scanner — takes highly accurate, digital 3D impressions of the teeth without the goop or gagging associated with conventional material impressions. No exposure to radiation, and increased comfort for our patients. Dual consultations. Having both doctors present creates immediate second opinions. A beautiful, fully renovated, state-of-the art orthodontic facility with computer digital imaging, including chairside visualizations of your orthodontic problems allowing for more precise diagnosis and treatment plans. We do not charge an additional fee for broken braces, emergencies, or prolonged treatment time. Complimentary removal of braces for special occasions like weddings and Bar & Bat Mitzvahs. We are an Invisalign® Elite Provider, having successfully treated many hundreds of patients with Invisalign. The doctors are always on-call and reachable 24 hours a day. The most detailed, accurate X-rays with the lowest X-ray exposure. Because our machine is digital, we use no polluting solutions, and these images are instantly displayed on our computer monitors, allowing for immediate diagnosis. We are very involved in the community, doing much with volunteer work and donations with schools and local charities.